Commercial UAV America – Mining Aggregates Session New perspectives on whether to in-source or out-source UAV-based services - Sumac Geomatics Inc.
Commercial UAV Expo is a professional unmanned aerial vehicle (UAV) conference that Sumac Geomatics has had presence at for the past 4 years. Todd Domney (Sumac Geomatics Managing Director), Adam Bozcek (Sumac Geomatics UAS Manager) and Will Tompkinson (Sumac Geomatics Business Development Advisor for Geomatics) have either presented, moderated sessions or participated in panel discussions at the event. Sumac’s team attends due to the strong professional use-case focus of the event, where there is usually an emphasis on sharing best practice and business issues. Sumac’s Todd Domney was an invited speaker to two Mining and Aggregates sessions. 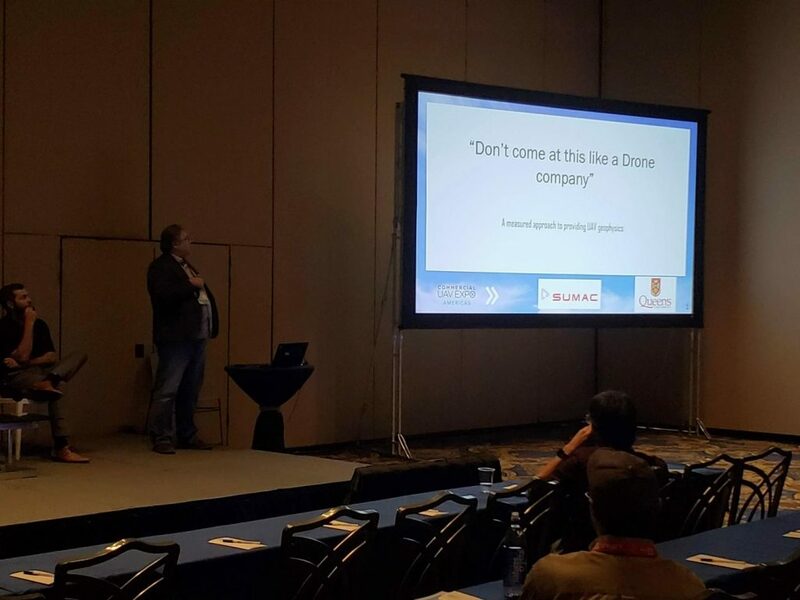 Todd was accompanied by Callum Walter, a PhD student sponsored by Sumac Geomatics at Queens University, through a collaboration that has resulted in the UAV Magnetometer solution that Sumac has since introduced to the exploration industry. During the panel discussion, speakers were invited to deliver a short (5 minute) presentation on a topic that was to the be used for discussion. Even though Sumac are one of the longest-serving commercial UAS (unmanned aerial survey) providers in Canada, we do not consider that a UAV-based implementation is always right for the user of the data that we deliver. With a company history steeped in the analysis and interpretation of remotely sensed data for a variety of industries, Todd and Callum presented on the approach that Sumac has taken regarding the design of our UAV-based magnetometer implementation that goes far-beyond simply flying a new type of sensor. This included not only understanding what can be interpreted from these types of surveys, but also addressing how the confidence of these data are affected by the entire workflow; from installation of technology, through to flight operations, through to analysis and interpretation. 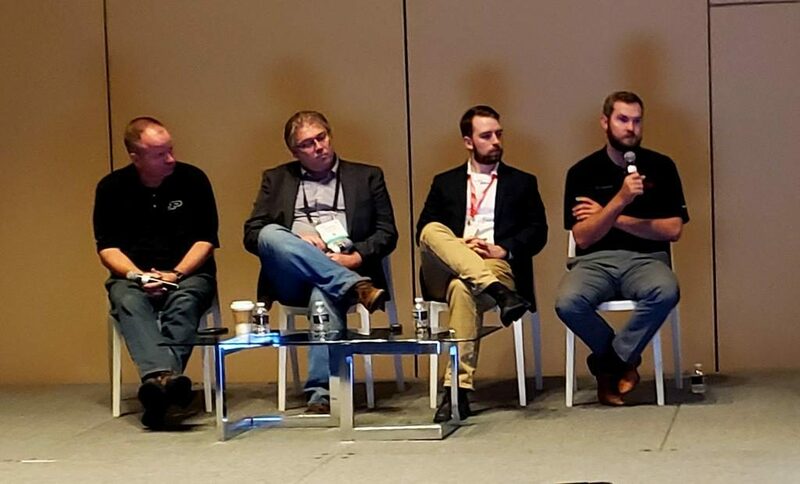 On a panel that included mine operators as well as service providers, topics discussed ranged from appropriate use of technology through to what to consider when establishing enterprise-level drone programs. One change that UAVs have brought to operations of many industries, including mining, is that UAV data acquisition can enable the operators of large sites (especially mines and quarries) to inspect their assets in a much safer, and more efficient manner than before. Inevitably this leads to the question of whether asset-owners should in-source their inspection operations. From the perspective of global operations at Rio Tinto, Andrew Carey gave an excellent overview of the centralized policies and procedures that Rio Tinto employ to ensure safe, reliable, standardized, and cost-effective UAV operations across all types of business units at Rio Tinto facilities. Justifiable concerns at Rio Tinto included the extent that untested and unsanctioned technology might be introduced to the workplace, in addition to receiving inconsistent deliverables from service providers. As an expert in automation, David Boardman had the foresight to point-out that in the future, many operations including flight operations will be completely automated. Indicating that perhaps current discussions about whether to in-source or out-source flight operations may become outdated. Nevertheless, successful UAS operations involve much more than just the flight operations themselves, and while Sumac’s flight team do get asked to perform specialist missions such as flights close to bench faces to collect oblique imagery for stress analysis; Todd outlined how an experienced UAV service provider can successively work alongside a mine’s flight operations team to provide training, and ensure that UAV programs are implemented correctly first time. Since it can be difficult for an UAV operations team to be experts in all parts of the survey workflow, a geomatics service provider can then provide data analysis expertise and capacity to enable reliable on-time reporting. This is a model the Sumac has successfully employed when supporting remote mining operations in Canada. Finally, considering automation, it can sometimes be difficult to know when there may be a problem. While any approved flight operations will have undergone rigorous testing, it can often be in the data analysis and reporting where undetected errors in procedure can occur. Whether these errors are significant will depend upon the relative value of the asset that is being measured. In the panel discussions, Todd raised the case of Sumac’s experiences in providing reporting services to the pulp and paper industry (to find out more, see Todd and Adam’s presentation from ILMF), where practices such as simply not defining a stock pile correctly can lead to misleading results at great cost to the customer. The operational context and deliverables required from a UAS program will vary dramatically between industries and organizations. Factors will include the operating environment, location of the site, regulatory considerations, timeliness of deliverables, the relative value of the asset, and tolerances on reported results. Sumac not only has deep experience in the entire end-to-end workflow but has also seen that especially for large enterprises, best results can often be seen when Sumac works with operations managers to leverage existing resources at the facility. Please contact Sumac Geomatics for a consultation to find out more.